SABR sells and distributes Loftware Print Server	Starter Edition (LPS Starter Edition) for Barcode Label printing and RFID encoding. The Loftware Print Server (LPS) is an enterprise solution for corporations that have significant product marking requirements for both barcode and RFID smart labels. It is designed to act as a middleware component between medium to large-scale business systems and marking devices such as barcode and RFID label printers. The Loftware Print Server (LPS) is "server-centric" based technology solution. Rather than supporting multiple PC's throughout your enterprise, which can be expensive, the LPS runs on a single server or high-powered PC work station. 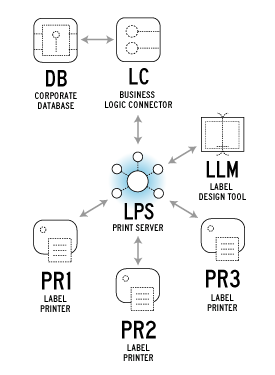 Essentially, the LPS is the central gateway keeper for managing bar code print requests between application(s) and network connected printers. It is the application bridge or "middleware" that allows disparate host applications to talk to proprietary hardware platforms (printers). Due to the high demands and ever changing needs of the global supply chain, it is no longer desirable or cost effective to write and implement custom barcode printing applications. New and emerging business applications are demanding that bar code-printing systems remain open, flexible and are able to grow as system environments change. With increased complexities in label compliance, many companies and software developers are seriously re-thinking how they implement bar code labelling systems. The LPS integrates with your entire network allowing you to have better control over your labelling system. Printer Family Drivers – Need to add a printer that does not appear in the printer menu? You can now use a single template to support multiple models of printers. ZPL2, IPL, EPL, and FingerPrint/Direct Protocol printer languages are supported. Printer Language Pass Through Support – You can now directly send commands to your printer from within your label! Printer language pass through allows embedding printer specific commands to support any unique printing requirements. ZPL2, IPL, and PCL 5 printer languages are supported. Bearer Bar support with ITF-14 and I2of5 symbologies.